It's time again for the Happy B Day Cake. 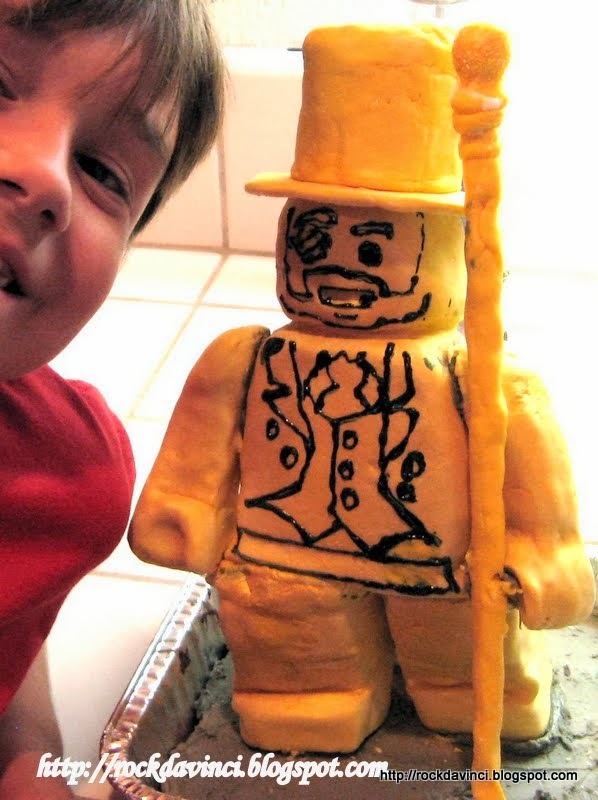 This year's challenge from my Grandson is LEGO's MR. GOLD cake. Series 10 of LEGO mini-figurine is to find the very rare Mr. Gold. There are only 5000 of it around the world, and there are couple more thousands still to be found. So, where is it? Well, here it is - in the form of a cake. Pre-prepare Marshmallow Fondant a weeks ahead. Have three long candy sticks ready. Some tooth picks and a couple of short candy sticks. 2 medium length candy sticks. These sticks are used to hold the cake up and arms and legs in place. The cake is made from a basic cake formula of mine - 3 eggs, 1 butter, 1 C sugar, 1-1/2 C flour, 1 tsp non-aluminum baking powder. Prep the LEGO Silicone Cake mold and Bake in 350'F. The cake puffed up perfectly for the 3-D shape; otherwise I would have baked another one to form the 'back' of the Mr. Gold. Make sure the cake mold is sprayed and floured for easier unmolding. Bake rather brown to make sure the cake will 'stand'. Prepare Butter Frosting. Cover the cracked area. Use 'fondant smoother' to shape. Tip: cut a sheet of 'wax paper' and frost over it. Parchment paper is bit expensive for this task, but the wax paper is perfect for this task. Place in Box and Spray with Edible Gold spray. Becareful not to inhale the spray. Use Black Gel frosting to outline Mr. Gold. Roll the fondant around a long stick to build his staff. Roll the ball in Crystal cake sprinkles, unless you have a plastic crystal to put on the staff, but be very careful if you have small toddler who might put anything in their mouth. So, its safer if its made from Fondant and Crystal sprinkles. Patch up some of the smeared black gel frosting by covering up with fondant pieces. Smooth out with some moist finger to blend it in. Didn't find Mr. Gold in a box of newly opened Series 10 box at the Toy R' Us, but this Mr. Gold cake brought cheers and smiles to every one. Don't know what challenge it will be next year, but I have yet to make a LEGO Rapunzel for my Grand-daughter.